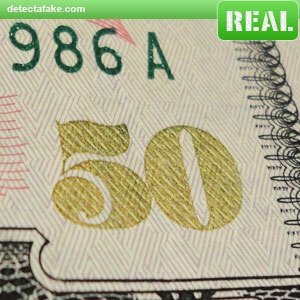 The 50 dollar bill is designed with two main features to look for in avoiding counterfeit bills. 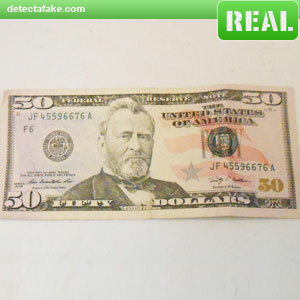 Below are the features to look for when taking these bills. The fist thing to look for is the security strip. You can only see it when a light source is behind the bill. To view this, hold your bill up to a light and the security strip will appear. It should be located in exactly the location shown above. To the right of Grant and crossing underneath the left leg of the "U" in United. 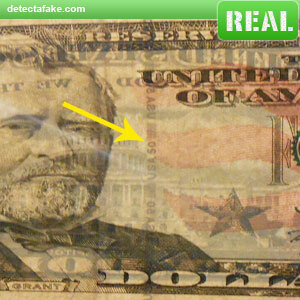 Next, while holding it up to the light, a hologram image of Grant will appear on the front/right side of the bill. This image is not visible without the light source behind it. 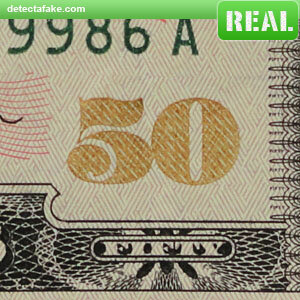 If you don't see this feature, it's counterfeit. Next, check the "50" on the bottom/right corner. 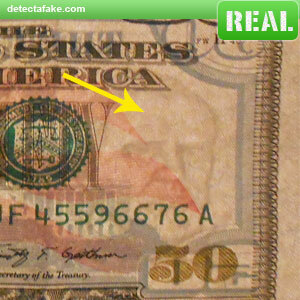 It is made with color shifting ink, so if you tilt the bill in different directions, the color will change.